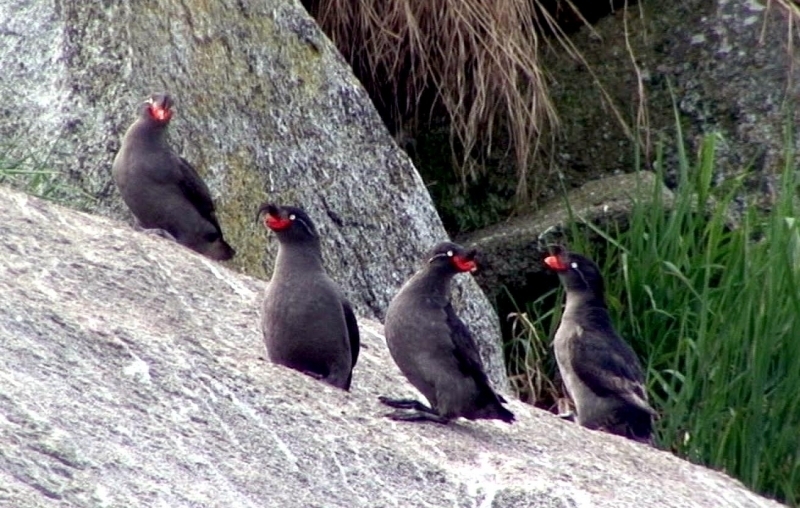 Crested Auklets live at sea most of the year, only coming to land to breed. 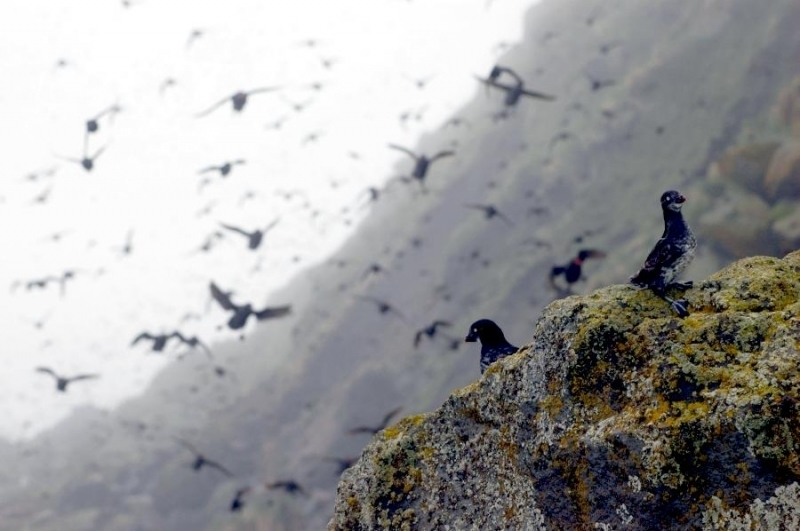 Nests are located on island coasts where sliding rocks form a rocky slope, with the largest boulders at the bottom and bare cliff at the top. 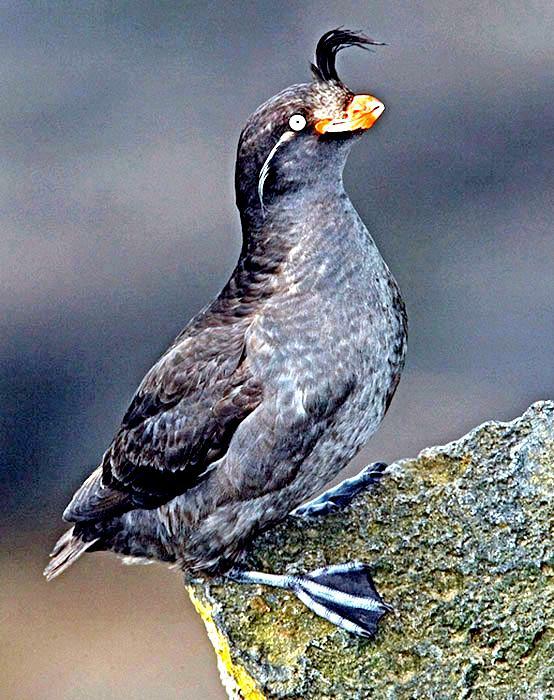 Crested Auklets have short stubby bodies with relatively long slender wings. 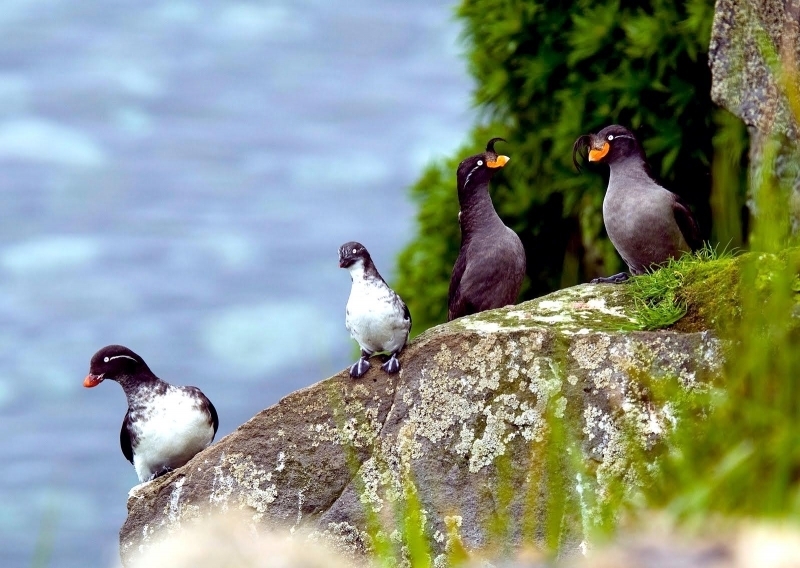 Their uniformly slate-gray or black plumage is very dense. 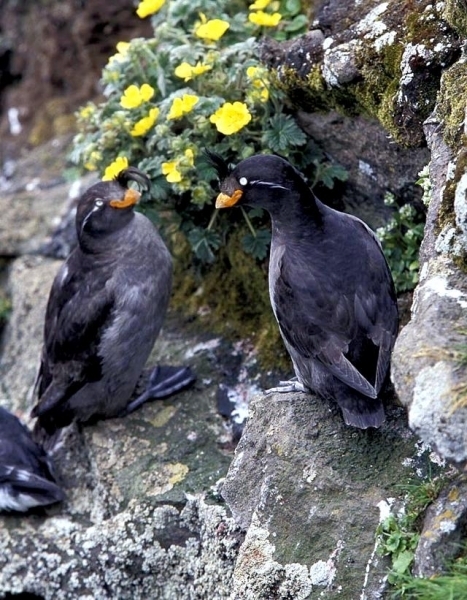 Their webbed feet are black and their eyes yellow. 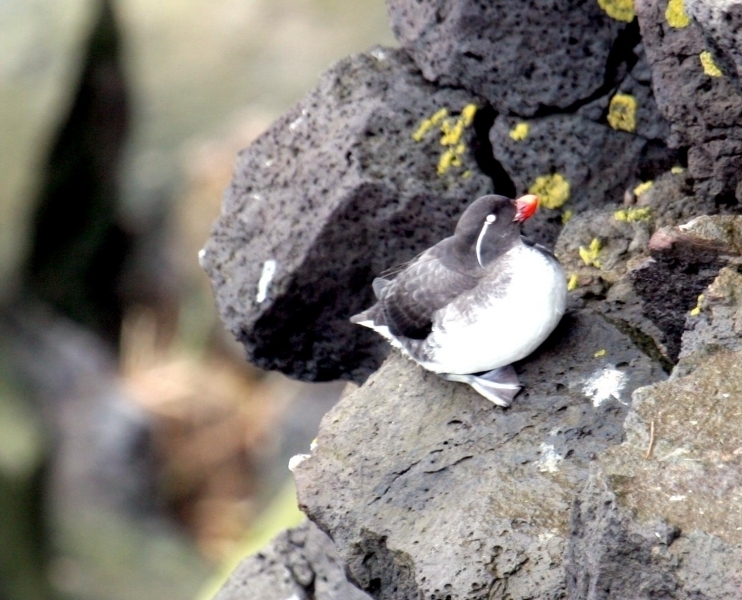 In breeding season their small thick bills are bright orange-red with a colored plate at the corners. 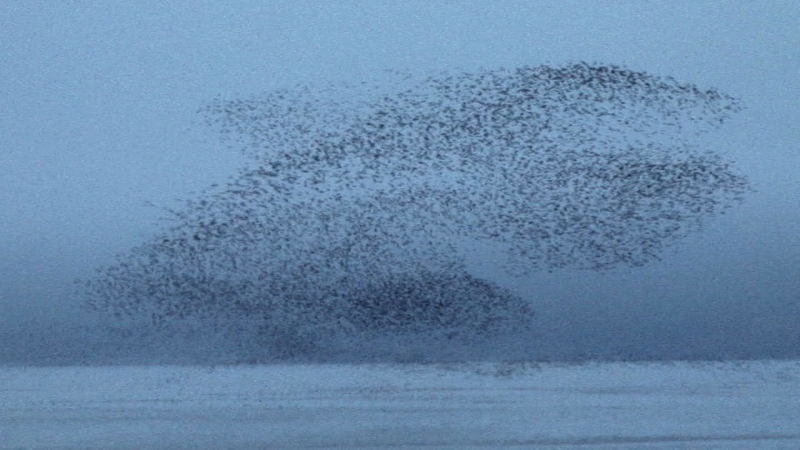 They have long, conspicuous, forward curving crests on their heads that droop over their eyes and thin, white plumes extending backward from the back of each eye. 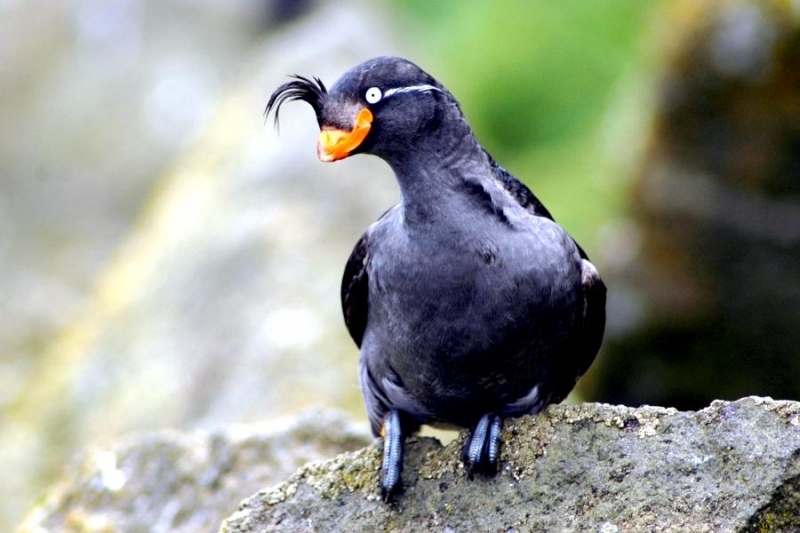 After the breeding season, Crested Auklets shed their bill ornaments and their bills become brown, their crests shorten and their eye plumes disappear. 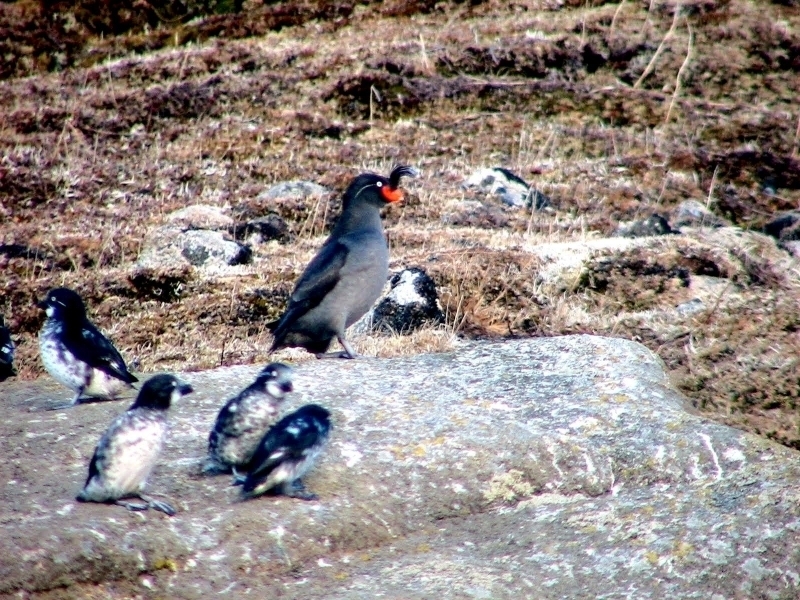 Juveniles lack the crests in all seasons. 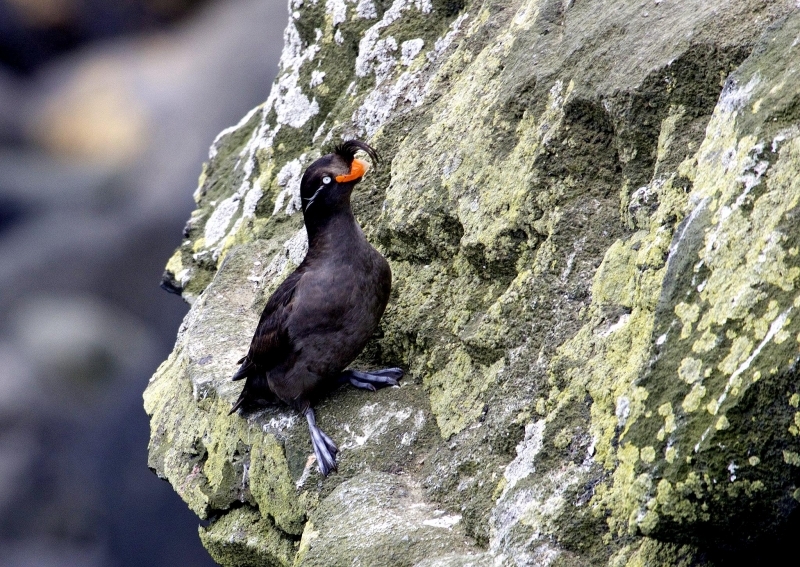 Adults are from 9.5 to 10.5 inches and 10 ounces is their average weight. 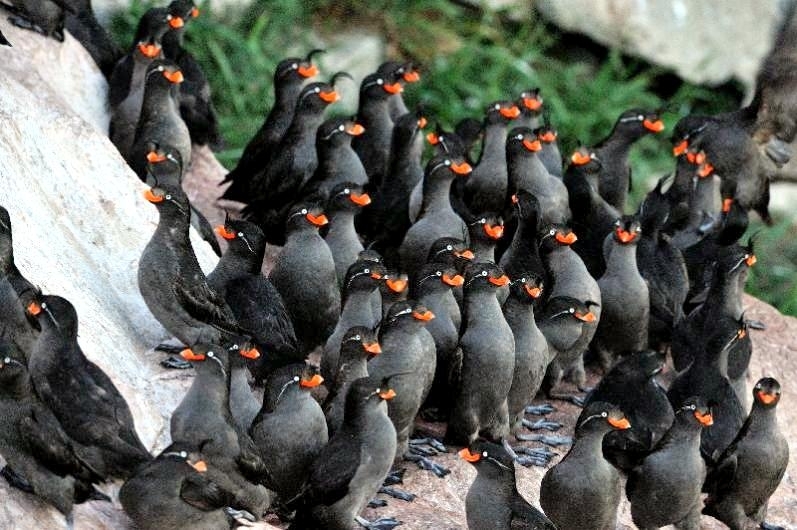 They eat squid, planktonic crustaceans, comb jellies and worms with 90% of their diet is copepods and other planktonic crustaceans. 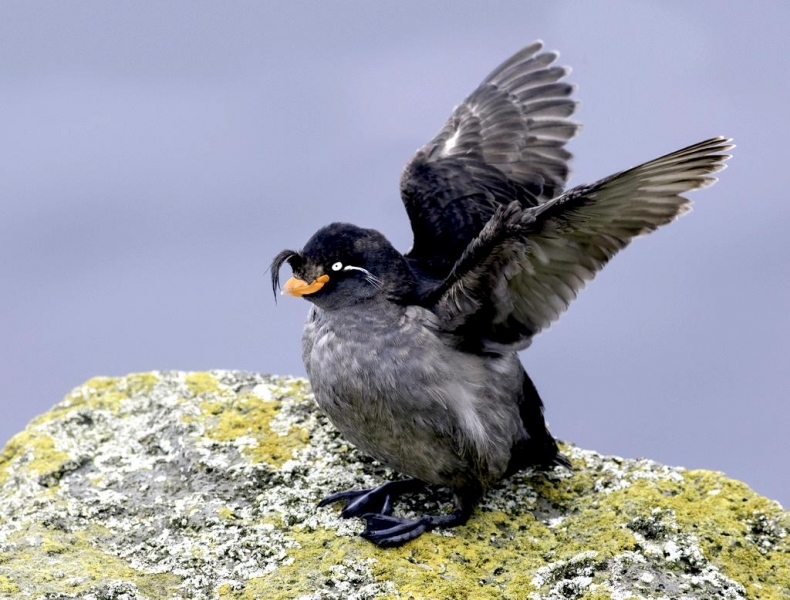 Crested Auklets catch their prey by pursuit-diving. 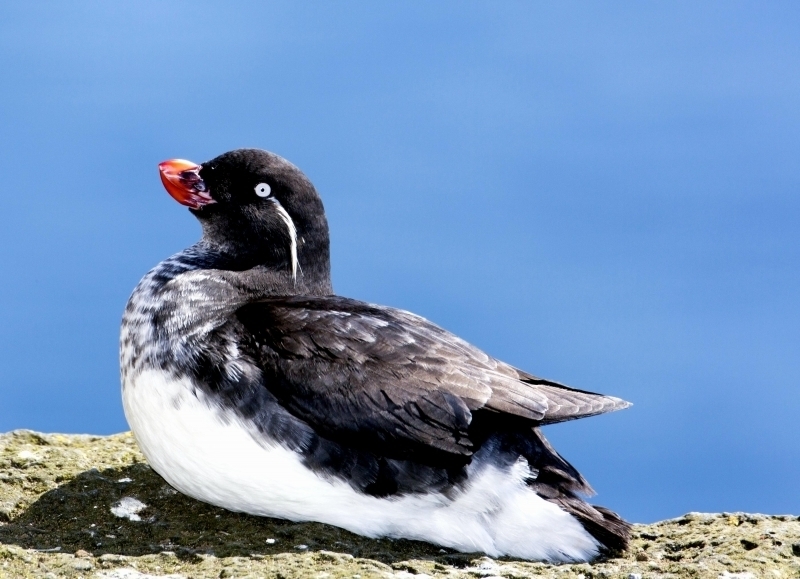 Resting on the ocean’s surface, they abruptly tilt forward opening their wings parallel to their body with the feathers oriented backwards. 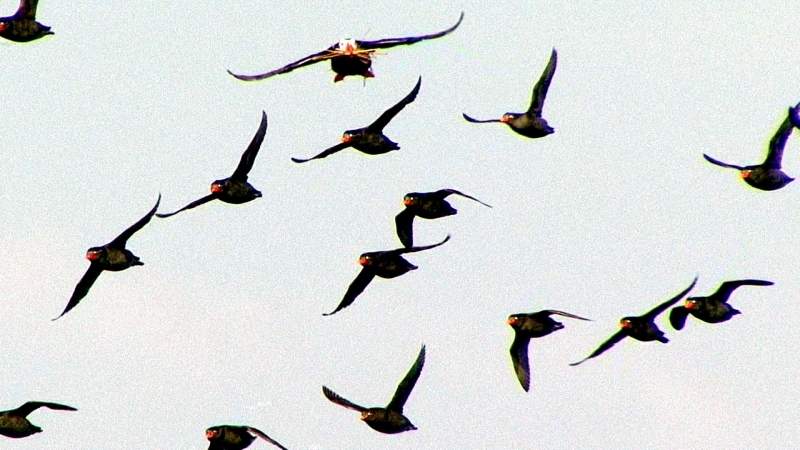 Keeping their wings only partially open to reduce drag, they dive. 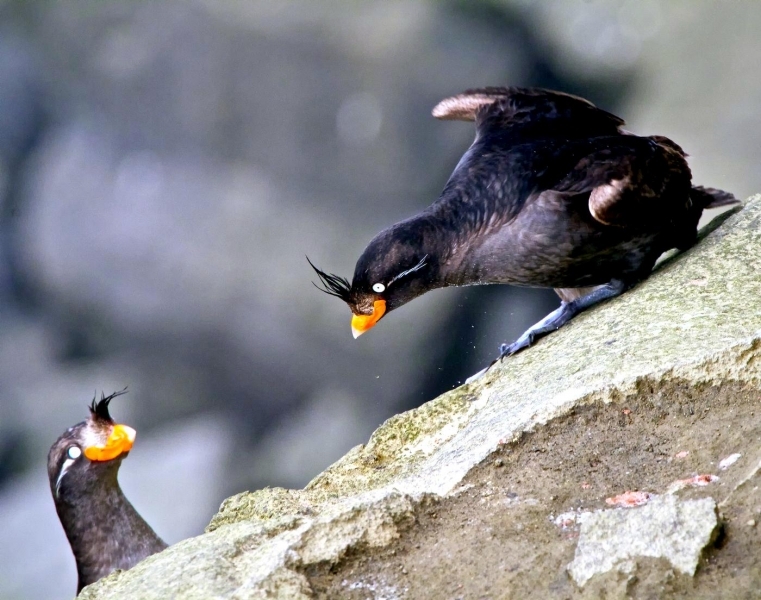 Underwater Crested Auklets beat their wings, “flying” at speeds about equivalent to that of a human’s walking speed. 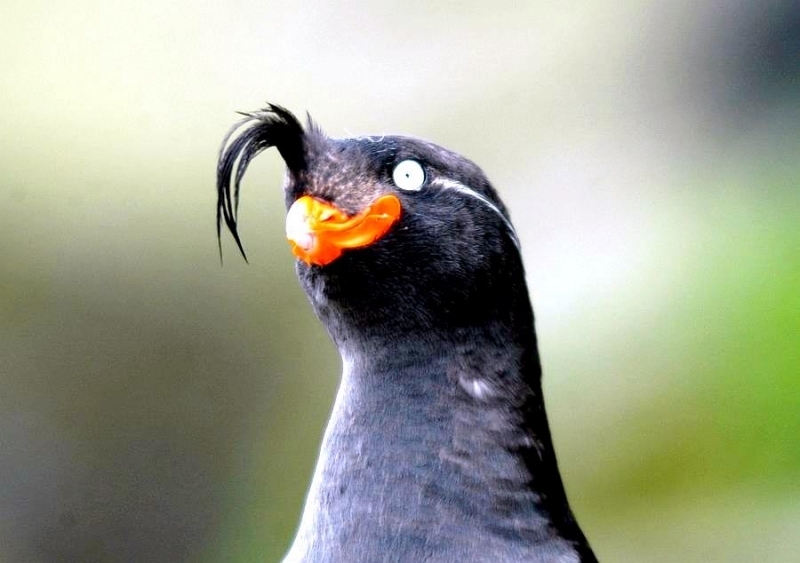 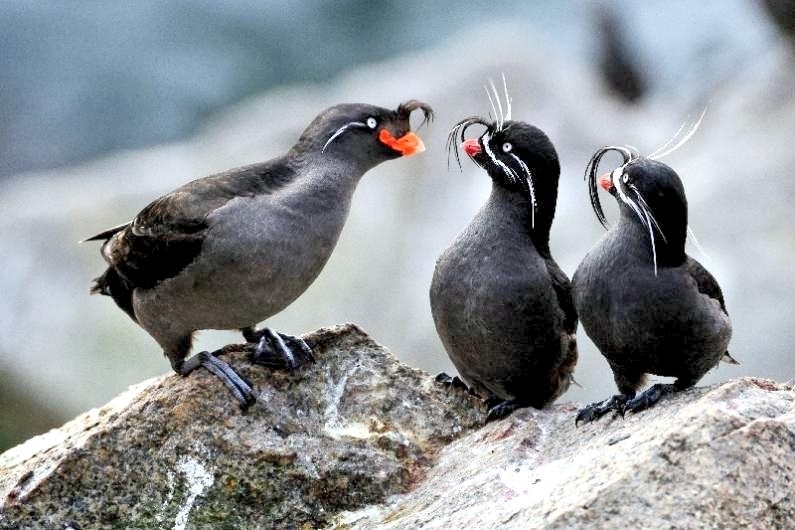 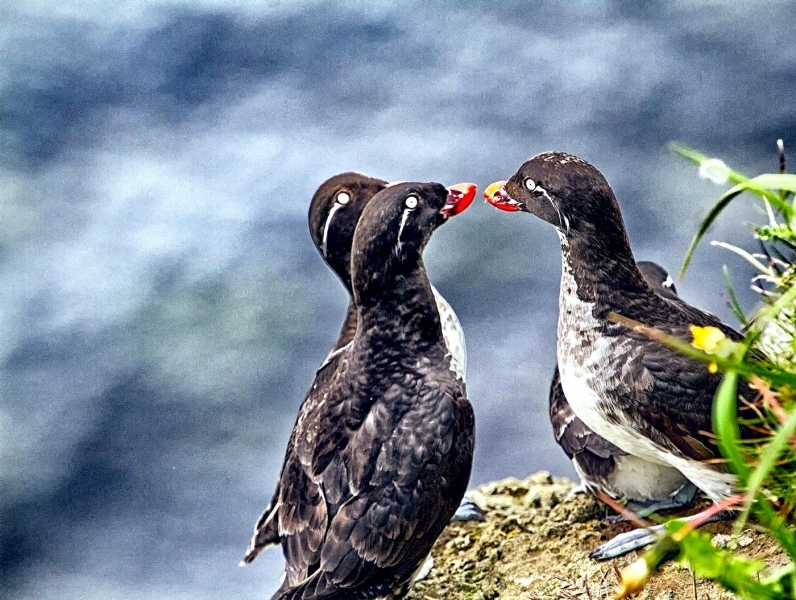 Crested Auklets are socially monogamous. 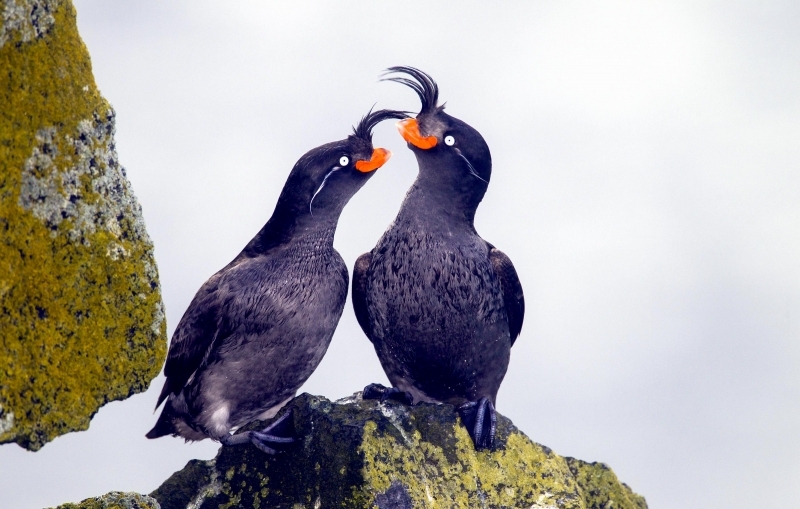 They do not maintain their pair bonds at sea but meet at the nesting site each year to reform their bond. 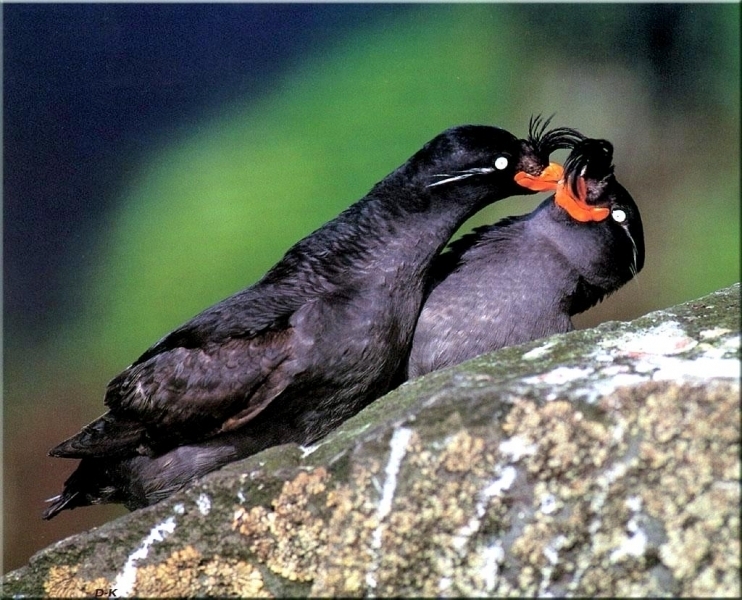 Mating usually takes place at sea near the nesting site. 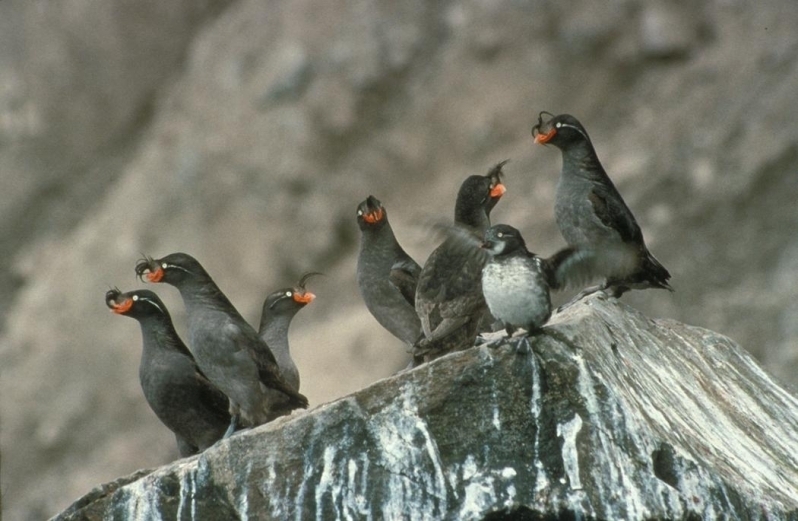 Nesting colonies range from 10-20 pairs to up to a thousand birds. These seabirds prefer secluded areas safe from predators for nesting and eggs are usually laid on bare rock in crevices on rocky cliffs. 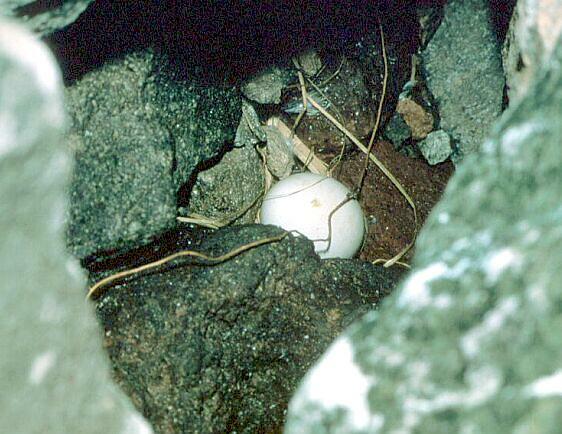 Normally, one egg is laid each season. 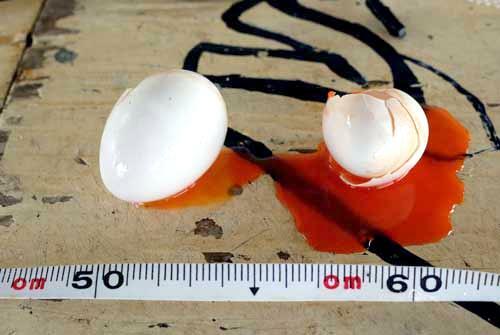 The eggs incubate for 34-41 days with both the male and female sharing responsibilities for the incubation and feeding of the hatchlings. 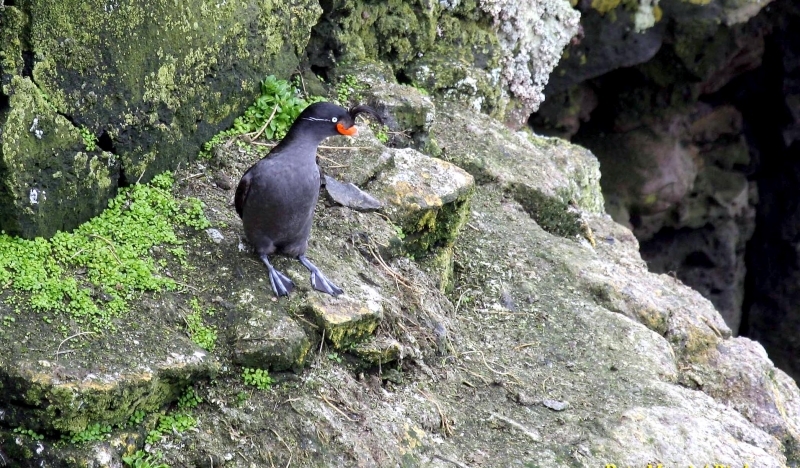 Parents carry plankton to the chick in a pouch under their tongue. 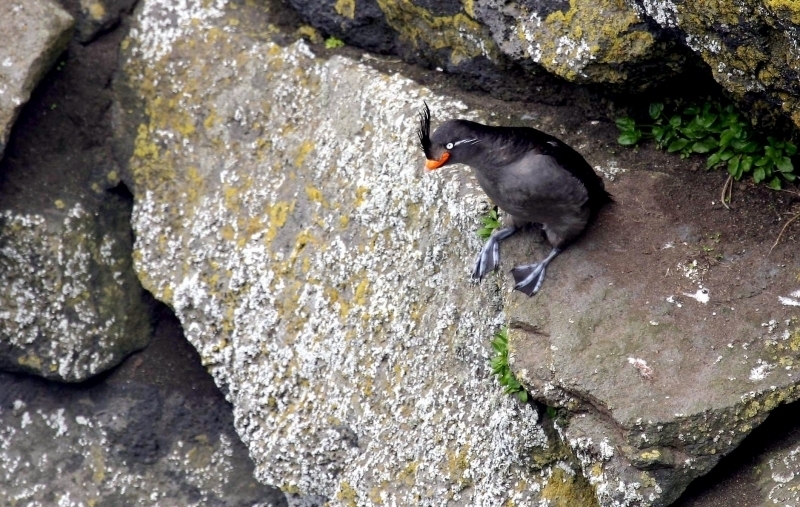 Parental duties end when the chicks fledge when about 35 days old. 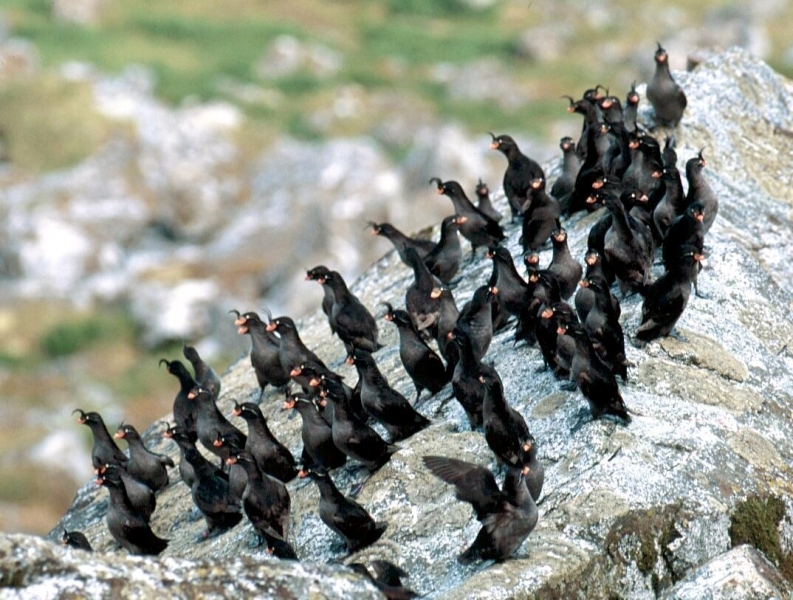 They fly directly to sea from the nesting colonies several feet offshore. 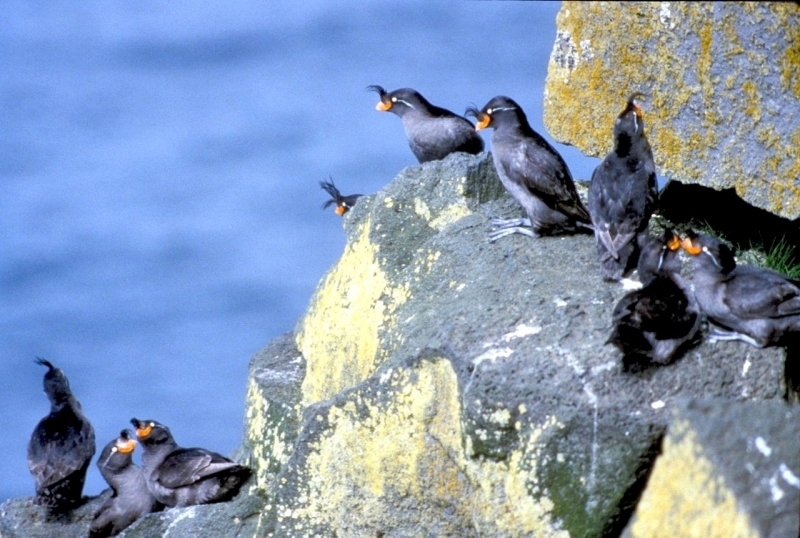 Crested Auklets are highly social, staying in large groups at sea and nesting in large colonies. 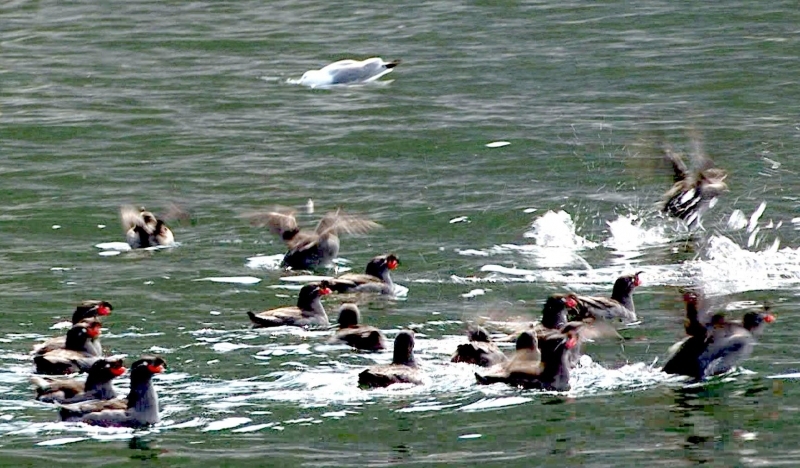 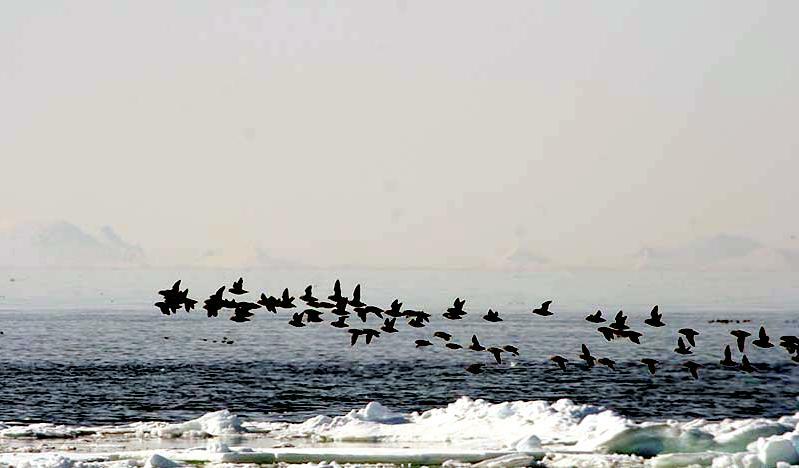 They fly close to the surface of the water with continuous whirling wing beats. 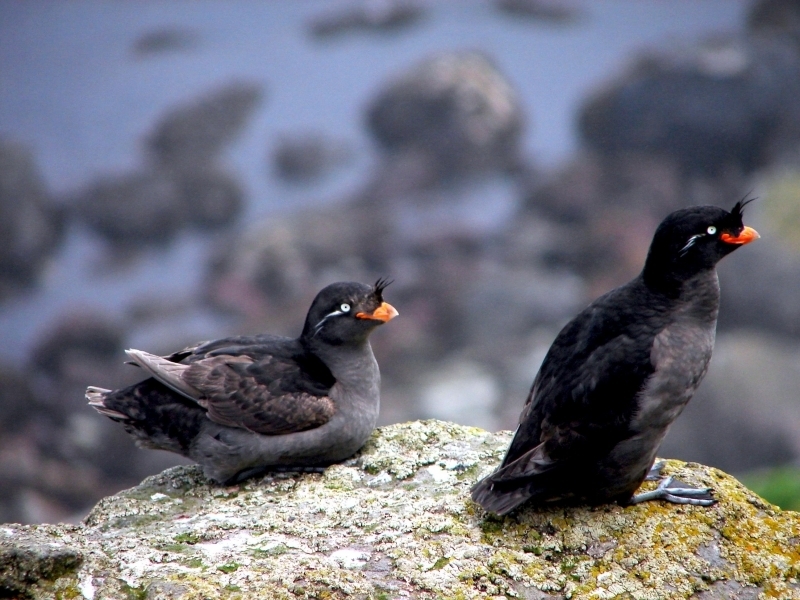 Silent at sea, these seabirds are the nosiest of the Auklets when in the breeding colonies vocalizing with groans, low hoots, grunts & barking calls. 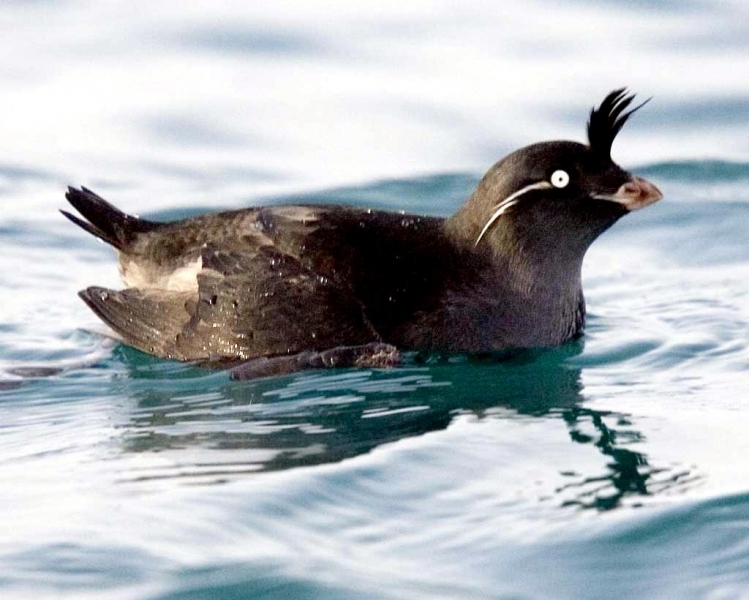 Well adapted to life at sea, their feathers are waterproof to keep out the cold water in which they dive to feed. 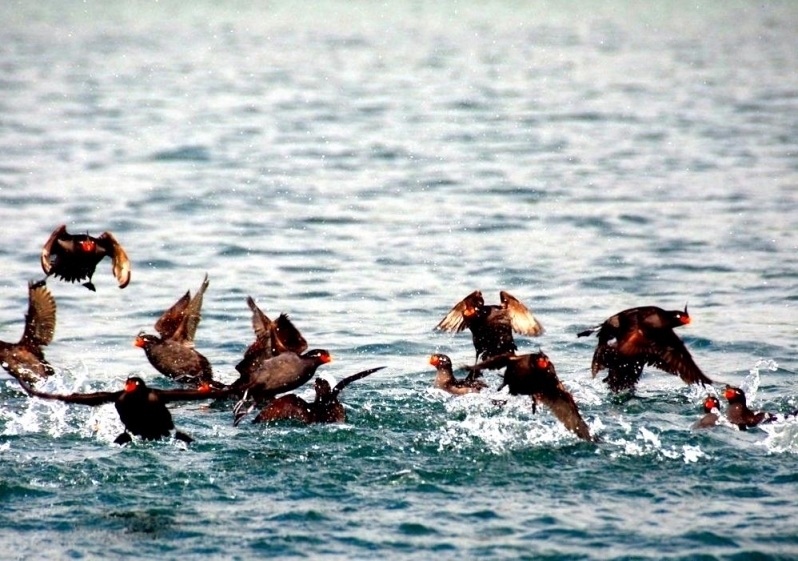 Their stiff wings help them to “fly” underwater in search of prey. 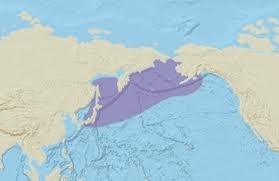 Their bones are very strong to withstand the underwater pressure. 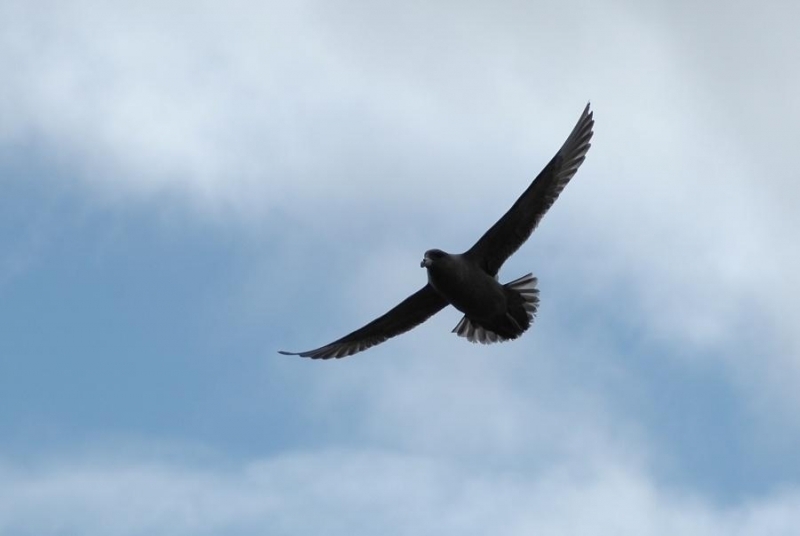 They are able to store oxygen in their body tissues and to use anaerobic respiration. 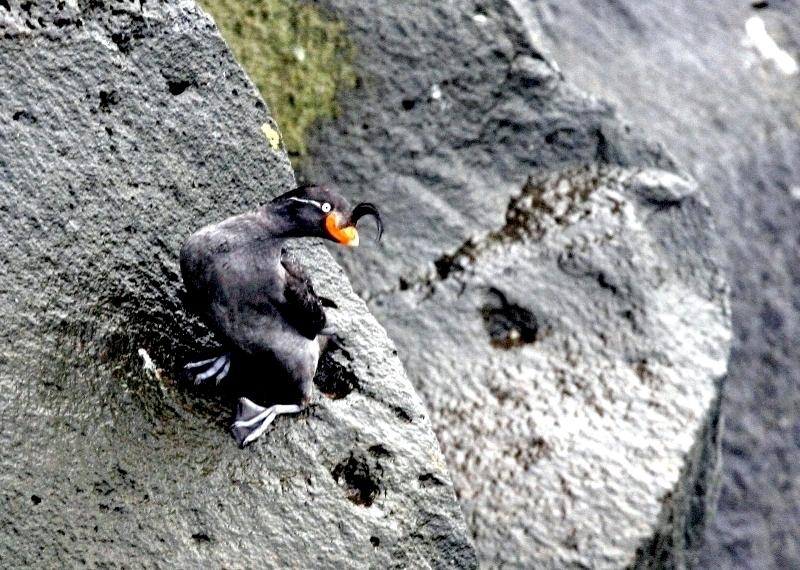 Both of these adaptations enable them to make long dives. 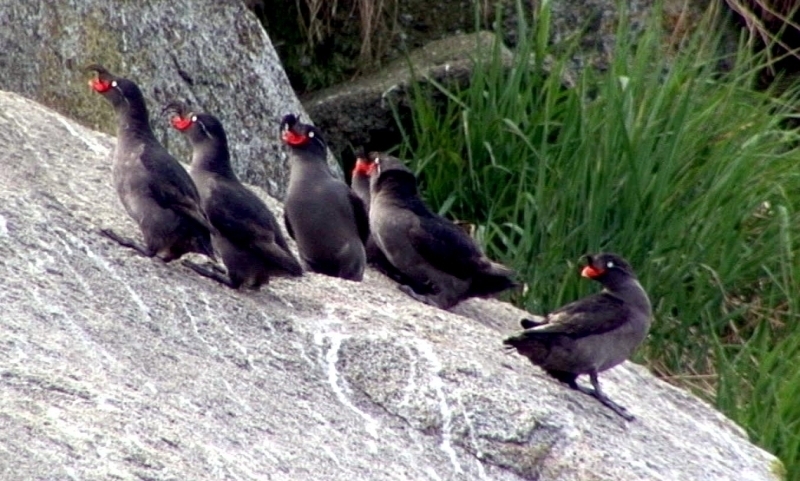 Crested Auklets use scent to communicate socially. 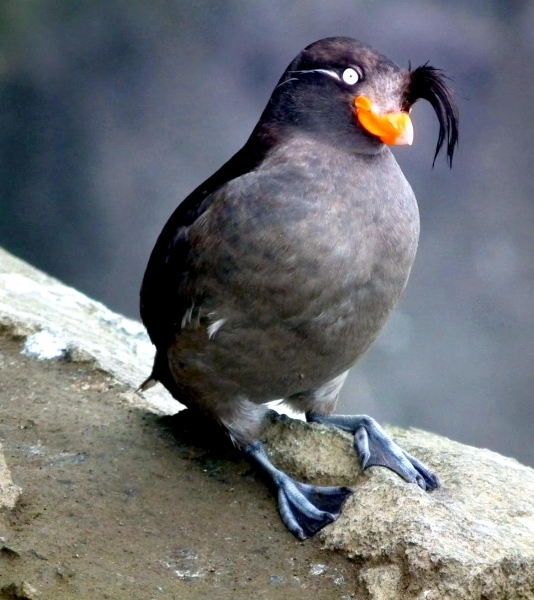 During the breeding season each of the male-female pair produces a strong tangerine scent in the nape of the ruff feathers of their neck. 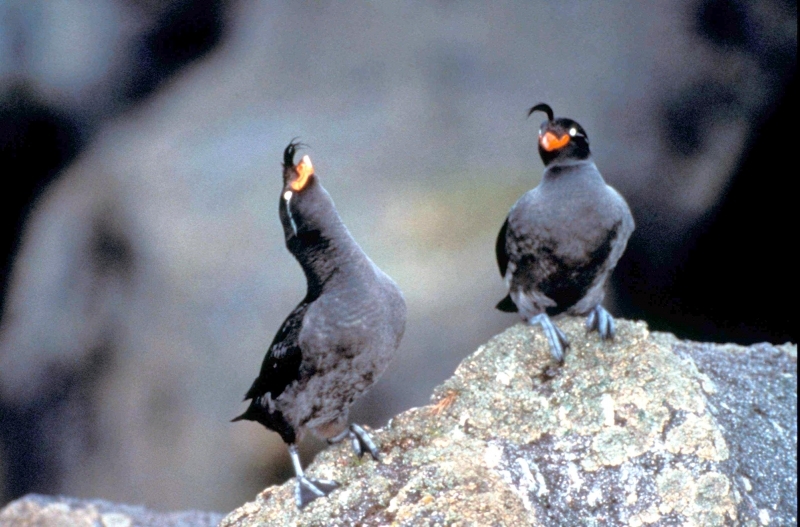 The scent is attractive to their mate and also signals their readiness to breed. 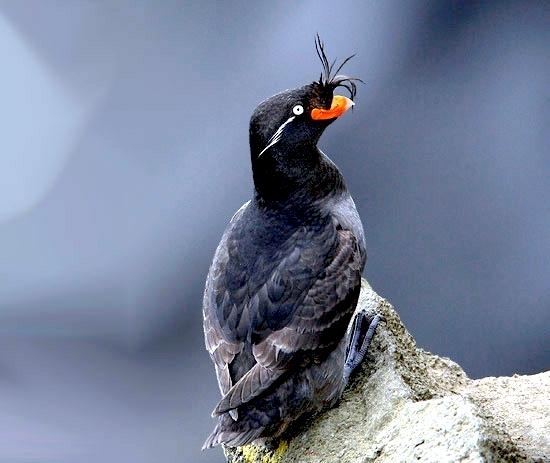 Both partners perform a “ruff-sniff” display in which they press their bill and face into the ruff feathers of their breeding partner. 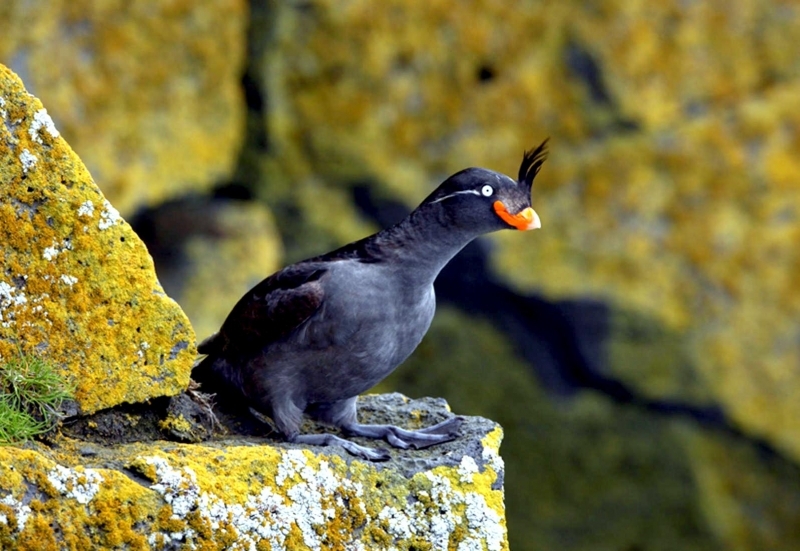 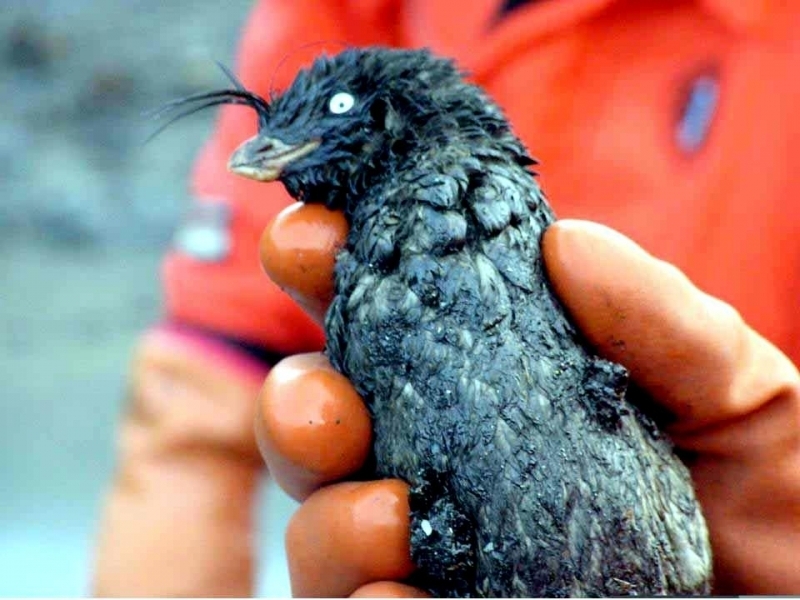 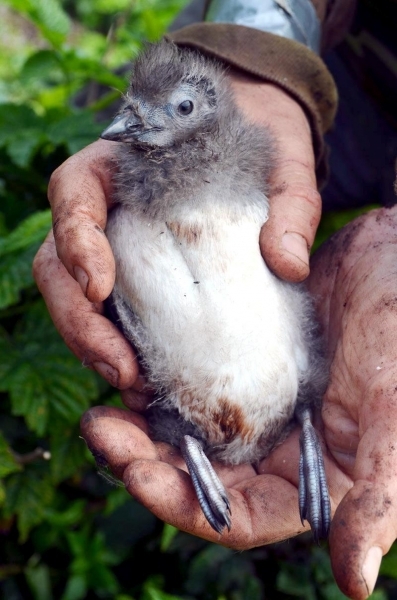 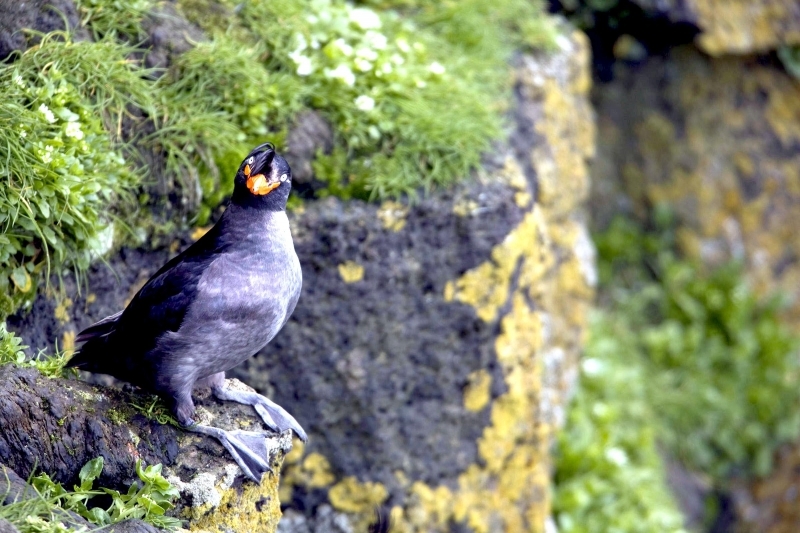 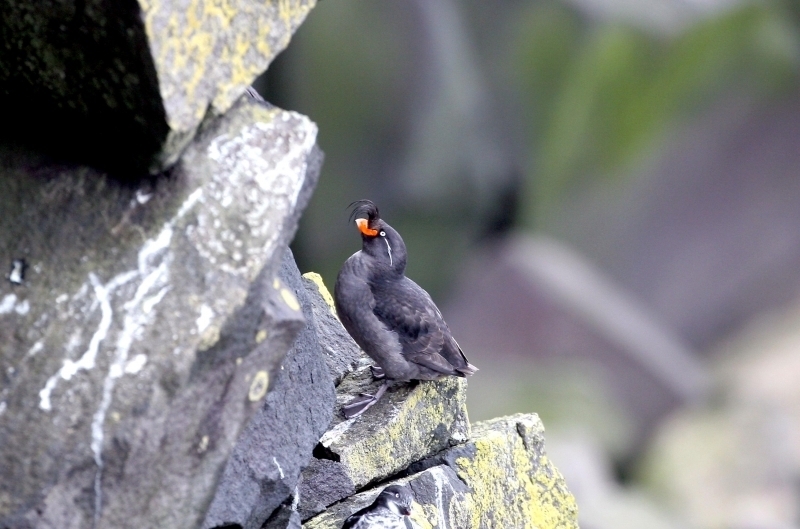 This scent is strong enough to be detected by humans some distance from the Crested Auklet breeding colonies. 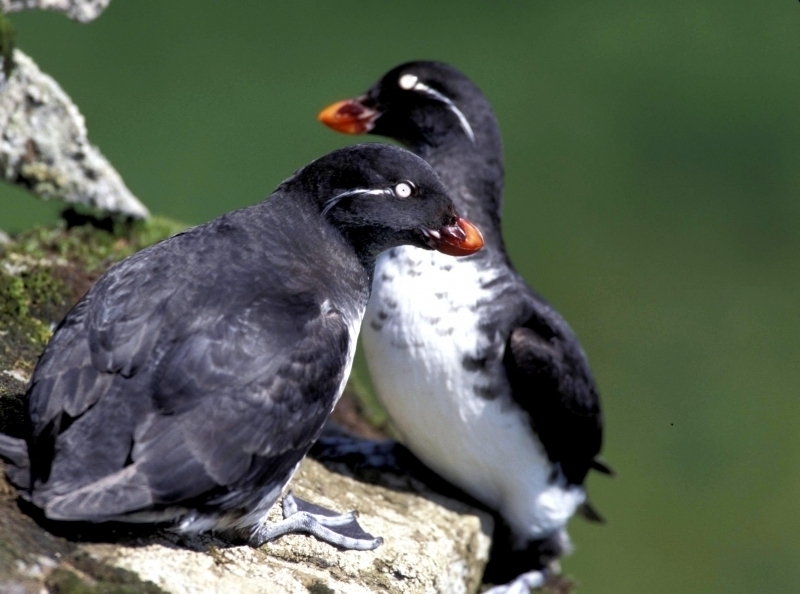 Estimates of their lifespan vary from 7 to 25 years.